Each year, more than one million people visit George Washington's historic Mount Vernon Estate, which he acquired in 1754 in large part for its superb view across the Potomac River into Maryland. "No estate in the United States is more pleasantly situated," he wrote. "It [lies] in a high, dry and healthy Country 300 miles by water from the Sea...on one of the finest Rivers in the world [sic]." The first president often pulled furniture out of his parlor to the piazza, where the view was most stunning. More than 200 years later, the view from Washington's prized estate remains largely unchanged thanks to strong protection efforts. In April 2008, TPL completed its third project to protect the viewshed. In conjunction with the Mount Vernon Ladies' Association, TPL has permanently protected a total of 232 acres that have been added to 4,000-acre Piscataway Park, all within view of the estate. 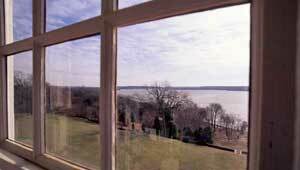 Of particular importance was Locust Grove, a 73-acre farm just 200 feet from the shoreline of the Potomac. The site includes the original house, dating to 1780, but little other development.